A perfect storm of low unemployment, geographic isolation, an aging population and the highest-in-the-nation cost of living has forced Hawaii’s businesses into a mad scramble for qualified workers. In response to this unprecedented challenge facing all local employers, our report provides practical strategies to help win the talent war. 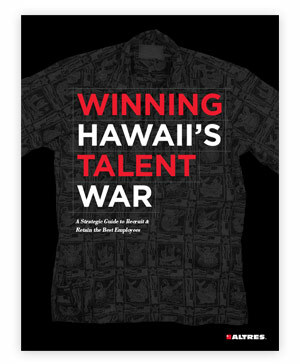 Fill out the form to gain immediate access to our Winning Hawaii’s Talent War.